• Red chilles dry - 1 number. • Sesame seed powder (optional) - 1 tea spoon. • Onion - 1 small. Soke Tamarind in water for 20 minutes, then remove the juice in a bowl. Roast green chilies on the flame till it changes its color. Crush green chilies with your hand add onions and salt to it. Add mashed green chills, onion, and salt mixture to tamarind juice, coriander leaves and mix it. Take a pan add oil, dry red chilies, mustard seeds, cumin seeds, turmeric powder and switch of the flame and add curry leaves once it is done add the mixture to Tamarind juice. Lastly, add sesame powder and sugar if required. 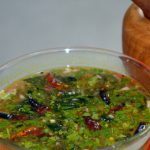 Patchi pulusu or raw rasam is an amazing blend of all three tastes like tanginess from the tamarind, spiciness from dry red chilies and sweetness and crispness from the raw onions. It is an uncooked rasam. Pachchi pulusu i... Read More..
Pachchi pulusu is a popular traditional Andhra delicacy. The word Pachchi in Telugu means raw and pulusu is a tangy soup. This dish is actually a raw rasam and does not need any cooking except for the tempering. It has an amazing blend of all three tastes like tanginess from the tamarind, spiciness from dry red chillies and sweetness and crispness from the raw onions.It's very simple to prepare and hardly takes about 10 minutes to put it together. There are many ways of making the pachchi pulusu or the raw rasam such as Vankaya pachchi pulusu, Pachi mamidikaya Pappu charu Raw mango rasam etc. This classic dish is made with simple ingredients like the diluted tamarind juice/ pulp, jaggery, salt to taste, chopped onions, green chillies and spices to impart an aromatic stew. The sweetness of jaggery balances out the tangy flavor of tamarind and the spice of green chillis while the addition of curry leaves along with tempering intensifies the flavor. Biting into crunchy raw onions and savoring the sweet-tangy smoky flavor of this earthy colored pulusu with rice, is heaven on earth. It can be had with rice or by itself as a soup or rasam. 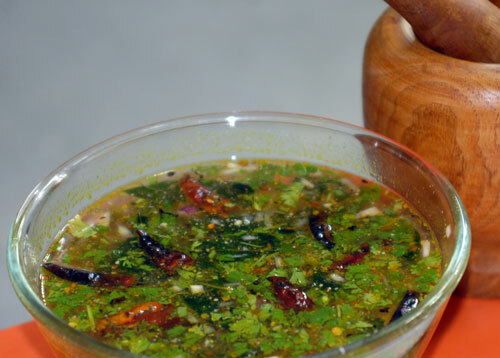 The raw rasam tastes awesome with hot rice and mudda pappu or plain cooked dal. It also goes very well with pulagam or kandi pachadi and rice. This is a recipe I love for its utter simplicity and not to mention, as it is completely addictive! Pachi pulusu is something that can be made in jiffy as it does not require any cooking process. It is made up of diluted tamarind pulp with finely chopped onions and green chillies and adjusted the sourness of tamarind by adding equal quantity of jaggery and some salt to taste. This dish is usually prepare when you run out of time or really need some zing to your taste buds. To make the dish yummier, roasted sesame powder is added that really enhances the taste of the raw rasam. This is a complete balanced flavorful stew which tickles your tongue with its unique taste. Try it to enjoy the flavors of it. Pachi Pulusu is a traditional Telangana recipe usually prepared often during summers to beat the heat as it was said by the Great Grandma that by having this raw rasam it cools down the body temperature and keeps you refreshing and soothing. For preparing this simple raw rasam, soak tamarind in water for 20 mins then squeeze the juice in a bowl and keep aside. Roast green chillies on the flame till it changes it color. Crush the green chillies with your hand add chopped onions and salt to it. Add mashed green chillies, chopped onions and salt to the tamarind juice. For tempering take a pan add oil, mustard and cumin seeds. When they crackle add whole dry red chillies, curry leaves and once it is done add the mixture to the tamarind juice. Lastly garnish with coriander leaves, sesame powder and sugar if required. Yeay, first to view and to comment. I love your videos!!!! 3:01 - 3:09 :) lol!!!! I went to an indian buffet and they still had lunch/breakfast out. What's that potato spread stuff called? it's yellow and I put it on a flat bread. YUMMY STUFF!